Capacity: Yields up to 20 cups of COOKED rice (approx. 20 servings). 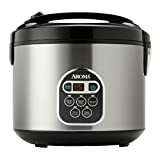 and Easy-to-use functions: Programmable digital controls with Steam, Slow Cook, White Rice, Brown Rice, Delay Timer (up to 15 hours) and automatic Keep-Warm. Quick tip: Nonstick inner cooking pot removes for quick cleanup and dishwasher safe Included accessories: steam tray, rice measuring cup, serving spatula, and exclusive recipes and coupons for Mahatma® and Carolina® Rice.